Have you ever looked at something many times without really seeing it? That’s kind of the story behind the beautiful, big Cypress tree on our property. Back in 2006, when Dan Walker was in the process of purchasing the land that is now Cypress Villages, he visited the plot numerous times without taking much notice of the magnificent tree on the southeast corner. The day we closed on the land, though, the owner called it to Dan's attention and a number of us went over to have a closer look. Once we really saw it, we were shocked we hadn’t noticed it before. About six or seven of us circled around the tree and stood, fingertip-to-fingertip, amazed at its great circumference. What a tall, venerable tree it was; how much shelter, shade and life-sustaining oxygen it offered us all. At that moment, Dan realized the Cypress tree was the perfect namesake for our project. At Cypress Villages, we strive to be stewards of the land. Our goal is to live as model of sustainability for ourselves and others, to draw attention to, celebrate and protect the valuable natural resources of our planet that many of us take for granted. By doing so we create both the kind of community we desire for ourselves right now, and one we'll be proud to leave to future generations. 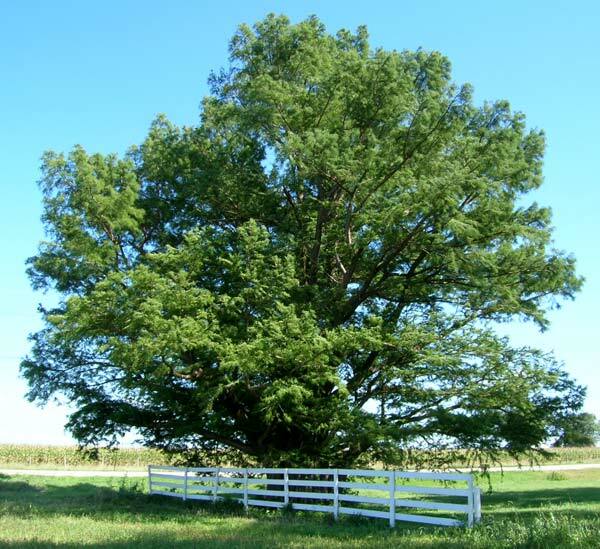 Value category: Symbolic specimen tree, development namesake, and historical landmark. Circumference: c. 30 feet, one inch.